Bushnell 361100 Onix 110 GPS Digital Navigation System 361100 FREE SHIPPING! The Bushnell Onix 110 is a compact and portable GPS unit designed for accurate backcountry navigation. 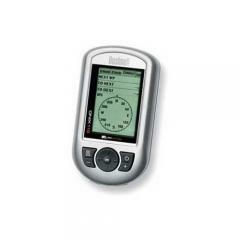 It offers four navigation modes: a user-friendly Simple mode, Advanced mode with deeper routing functionality, a Sport option that includes training logs and other exercise functions, and a special Geocaching feature. Its 2.6 inch LCD screen is easy to read for immediate access to useful navigation data. The device features 128 megabytes of user memory, allowing it to store travel data logs, or up to 100 waypoints and 50 routes, and downloads data using the included USB cable. It also comes pre-loaded with a base map of the United States and Canada. It features rugged rubber armor for durability and meets IPX6 water resistance standards, perfect for surviving the outdoors. ©2002-2019 CopsPlus.com: Bushnell 361100 Onix 110 GPS Digital Navigation System 361100 FREE SHIPPING!